A major inquiry into the management of the Queensland prison system took place in 1887, and the final report remains one of the most fascinating documents in Queensland prison history. 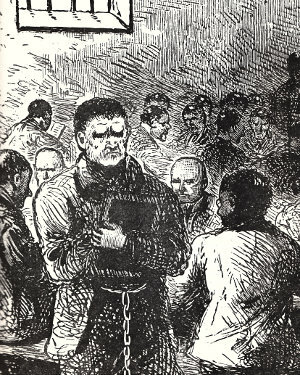 Barrister William Kinnaird Rose and immigration agent William Parry-Okeden travelled around the colony inspecting numerous prisons, police gaols, and lockups. They interviewed staff and inmates at length, and recorded the surprisingly frank and revealing statements they heard. Not only is their report the kind of brilliant historical document that modern, secretive governments would never publish, but it also led to the legislation of the Prisons Act 1890. The following extracts from the report were recorded in April 1887 when Rose and Parry-Okeden visited HM Prison at Boggo Road and interviewed various prisoners about life in what was still a very new facility. What they heard about food, hygiene and medical treatment for venereal diseases left little to the imagination. The racist attitudes of the day were also on full display. 'In wet weather like this there is no place to get out of the rain, except in the bathhouse or closets. At present, and for the past ten days, we have no work to do. We are compelled to go into the yard and spend the days doing nothing if there is no ‘kapok’ to tease. We never get the same rations two days running - I mean the quantity. Sometimes the dishes in which the hominy is brought to us are half full, sometimes three quarters full, and sometimes full. On one occasion when I complained of the small ration of hominy, I was told they were rather late in the cookhouse and busy. The meat given us at dinner time is badly cooked, and so tough that it is impossible to eat it. I am an American from New York, and I have never been here before. The meat is so tough that we cannot tear it with our fingers or teeth. There are no knives and forks allowed - at least I have never seen any; and it is cut up in pieces too large to swallow whole. The dishes are generally dirty, only half-washed. The same quart-pots in which they serve out soup are used for drinking water in the cells at night, and they are always greasy. I believe there is a regulation that every man should have a bath when admitted and once a week after; but I know men who have been here since I came here, ten weeks ago, who have not had a bath. Bathing is more the exception than the rule. It is only a fortnight since I had a towel. Before that, for eight weeks, I had to do the best I could and use my handkerchief. I asked repeatedly for a towel, and Mr Sneyd, the warder on duty, told me there were none. I kept at him every day asking for a towel, and finally I got one. The allowance of soap is not sufficient. I don’t believe we get half-an-ounce a day; the piece for the week seems only to be about two ounces. I have never seen any disinfectants used anywhere in the gaol. The tubs and buckets put into the cells smell very badly at times. Men who are doing probation - i.e. locked up in a cell all day, with the exception of two hours for exercise - have during the day bucket at all, but an open chamber with no lid to cover it. At night time in those same cells three men have to sleep. 'In one case I was sent with two others to a cell where three Chinamen had been sleeping. Those blankets were stinking, and we did not take off our clothes. Next day, on our complaint, those Chinamen’s blankets were taken away and other dirty ones put in their place. I take a bath every morning, but for days in succession I got vermin on me from the blankets or bed. Complaining seems to be no good whatsoever. The sanitary arrangements are vile - frightful. The stench from the tubs is awful at night, and no disinfectants are used. [i] One of the double-standards of the age was that women with VDs were required - under the Contagious Diseases Act 1868 - to be confined in the lock hospital, yet men with the same disease were allowed to roam free. Explore over 200 pages of prison history, hundreds of images, and over 1,000 links to records and newspaper articles.